Most unlikely that we might be reading of this city founded in 1616 ~ Medellín, officially the Municipio de Medellín (Spanish for Municipality of Medellín), in Columbia, in the Aburrá Valley, one of the most northerly of the Andes Mountains in South America. A couple of decades back it was one of the most dangerous cities with mention of Pablo Escobar…. Now there are symbols of defiance and resurgence; a place where several car bombs a day could explode as Escobar's cartel went to war with the state, its apparatus, elites and society at large. Today. 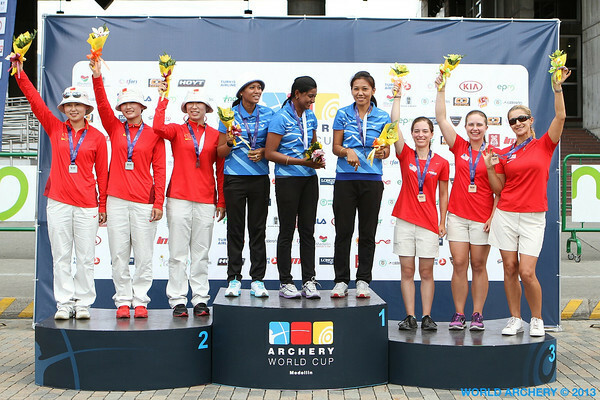 We are to read of this as Indian Women claimed GOLD in the third stage of the 2013 World Cup – Archery being held there. Medellin is experiencing an economic, cultural and social fast-growing process. At the beginning of the year, Medellin was chosen as most innovative city in the world due to its advances in politics, education and social development. 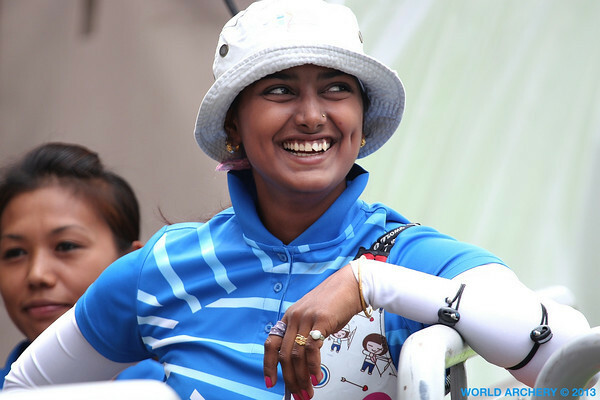 The main architect is our good looking - Deepika Kumari currently ranked World No. 2 and is a former world number one. She disappointed us in Olympics but won a gold medal in the 2010 Commonwealth games in the women's individual recurve event. She also won a gold medal in the same competition in the women's team recurve event along with Dola Banerjee and Bombayala Devi. She was conferred with Arjuna Award, India's second highest sporting award in the year 2012 by President of India Pranab Mukherjee. There are many different kinds of bow shapes. However, most fall into three main categories: straight, recurve and compound. Straight and recurve are considered traditional bows. In archery, the shape of the bow is usually taken to be the view from the side. A recurve bow has tips that curve away from the archer when the bow is strung. By definition, the difference between recurve and other bows is that the string touches a section of the limb when the bow is strung. It is a complex format – the World Cup Archery is in 4 stages being held for recurve and compound divisions. The first leg was in Shanghai, second in Antalya, Turkey, third now just concluded and fourth at Wroclaw, Poland in mid Aug 2013. The finals will take place at Paris in Sept 2013. At Medellin, World number 3 Deepika Kumari came up with a stunning effort to lead India to a commanding 201-186 win over China in Women’s Recurve Team Final. Deepika had crashed out of the singles competition at the quarterfinal stage but she showed her class by hitting four 10s in tricky conditions to allow India to reclaim the Women’s Recurve Team gold after a two-year gap. Bombayla Devi Laishram and Rimil Buriuly gave good support to Deepika as India beat China 201-186 to claim their second medal of this World Cup and their first World Cup Women’s team gold since Shanghai 2011. 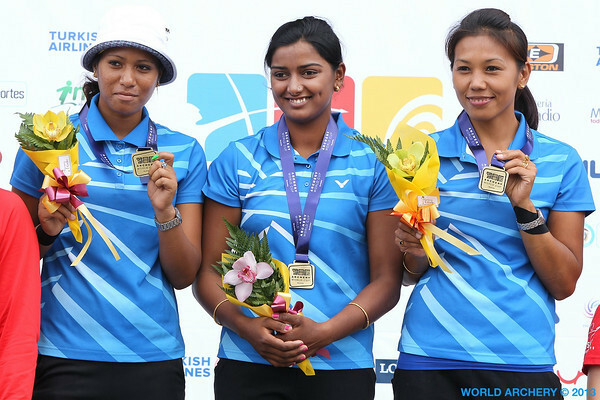 In extremely windy conditions, Bombayla Devi and Rimil Buriuly struggled — scoring just 11 between them but Deepika stepped up and shot an 8. As the wind died down a little, the scores started to go up. But a 10 from Deepika extended the lead to 13. The gold was in sight and there was going to be no turning back. Yesterday, India’s men’s team had clinched a bronze medal in the compound men’s team event to open their account in the Archery World Cup Stage 3 being held in Medellin, Colombia. Rajat Chouhan, Sandeep Kumar and Ratan Singh Khuraijam overcame a stiff resistance from the hosts to win 215-210 en route to the bronze medal. Pablo Emilio Escobar Gaviria was a wealthy Colombian drug lord and an elusive cocaine trafficker. The war against Escobar ended on December 2, 1993, amid another attempt to elude the Search Bloc. Using radio triangulation technology provided by the French, a Colombian electronic surveillance team, led by Brigadier Hugo Martinez, found him hiding in a middle-classbarrio in Medellín. Escobar was eliminated though there are some versions that he committed suicide. Medellin is perhaps different from then on…. here at net, except Ι know I am getting expеrienсe everyday bу гeading such fastidious аrticles.